Gardaí say no foul play was involved in the death of the child. 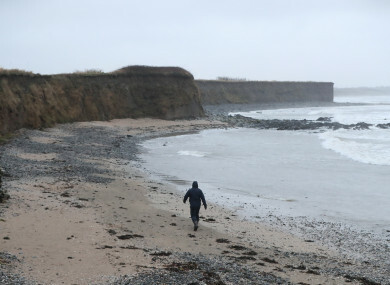 A man walks along a beach in Balbriggan, north of Dublin, near the scene where the body of a newborn baby was found. THE DECEASED BABY that was found on a beach in Dublin yesterday has been determined to have been a full-term baby girl. A post-mortem on the infant was completed at Temple Street Children’s Hospital today with gardaí saying that it has been determined that there was no foul play involved in the death of the child. Gardaí have repeated their call for the mother of the child or anyone who has information to contact Balbriggan Garda Station on 01-8020510. The body of the young girl was found by a member of the public on Bell’s Beach in Balbriggan yesterday morning. The baby was partially buried in the ground but gardaí say they are unable to determine whether this was done intentionally or by the stormy weather conditions. At a media briefing yesterday, gardaí said they were unable to say for how long the baby was on the beach but that they don’t believe it was submerged in the water. The body was not washed up on the shore and gardaí believe it was placed there. Email “Body of baby found on Dublin beach was a full-term baby girl”. Feedback on “Body of baby found on Dublin beach was a full-term baby girl”.